Samsung 4.5 cu. ft. Washing machine featuring AddWash, a system that lets you add to the load during the wash. Open the small AddWash door to easily add in all of the forgotten laundry even after the wash cycle has started. A full load can be washed in only 36 minutes and get more laundry done faster with Super Speed. 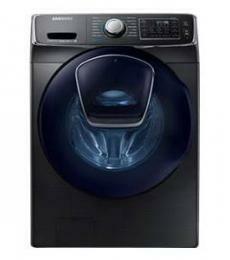 The combination of AddWash , large capacity, and Super Speed, saves you time and energy. *Normal one-hour wash can now be completed in as little as up to 36 minutes as compared to WF511 washer without Super Speed. Based on DOE standard's average of 7.5 loads per week.